A few months ago, I was faced with a minor dilemma. I had decided to finally get around to changing the rear brake shoes on my spouse's bike, but I needed a way to raise the bike. My shoulder wasn't up to any lifting, and I needed a way to steady the bike when I got it raised. Now, I know about the homemade lever jacks using wood and pipe, but like most home mechanics, I have a floor jack. I also, used to have a bike jack, but the Savage frame never really fit very well and it always seemed wobbly. I sold it. So I had an idea...and at the time, I thought that it was an original idea worth patenting...until I saw an ad in Motorcycle Classics and did some research. So, anyway, before I realized that I wasn't going to be rich (I can dream, right? ), I built my little bike stand prototype and tested it and photographed it. All that it took was a good piece of 5/8" board, 2 x 4's, wood screws, 10d nails, and eye-screws. Here comes my prototype, in pictures....if you build one and use it with care, it does works great. Note: You do want to keep the bike perpendicular with the stand because of the steering head angle. The jack stand is under the swing arm, not the muffler bracket! I first raised it to check, then I lowered it to unbolt the front wheel. I forgot to mention that the straps don't have to be real tight. Just snug. Don't even compress the forks. Just like it takes very little force to balance a bike by hand, it doesn't take a lot of tension on the straps. I have everything I need in the shop. With some additional hooks to hang it up out of the way when not in use. I have just the out of the way stop for it. Follow me into the twisties.... I'll wait for you on the other side. There you go. It sure beats block and bricks, and most "shade trees" have a floor jack anyway. One improvement I can see is move the eyehook from the end of the 2x4 to the 4" wide side, hook pointing opposite side of the wheel well but still on the end of the 2x4. That way in case the jack slips and it starts to roll forward, the straps will tighten pulling it back to right. With the eyehook on the end, it could roll. Or with an eye towards storage, use hinges to attach the wheel well boards to the cross piece and add a strap accross the wheel well boards to keep them from spreading. And it'll fold flat for storage. A little clamping pressure on the tire and your little friend isn't going anywhere without your permission. If you notice, the straps on the front are very loose. Hardly any fork compression, and therefore no spring tension. When I tested it you could push sideways on the bar, but the fork springs would force it back to neutral upright. As for rolling forward, I had thought of a taller bumper at the front of the tire but I used just what I had on hand. Anyway, in all the jacking I never felt insecure about it rolling forward. Folding and hinging is a good idea. The high priced stands actually capture the tire and don't need straps anyway...but the stand must not be able to slide on the floor. The straps create a tripod of sorts. 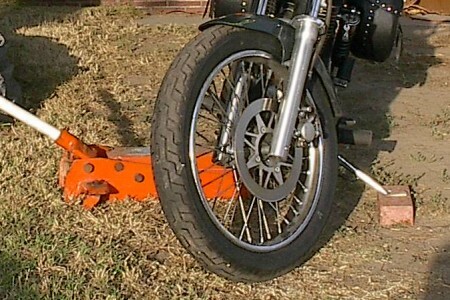 What sort of stumped me was an easy (remember the topic) Poor Man's Bike Stand that had a more secure fit for any size tire...say 4 to 7 inches. Using a V Shape is one method, but a fatter tire sits much higher off the floor that way. Thats cool, as much as I got to see. I waited about 10 minutes & pics still not loaded. Sllooowwww ISP,, Question I have is, how do ya get the rear wheel off the ground? I have a low profile floor jack & your doohickey looks real cool. The Savage has a real narrow balance point under the engine. With the front strapped down, I jacked it at the very rear of the engine and put the jack stand under the swingarm. Here's another photo to show how handy this can be...and it only cost a couple bucks to build. If ya look close you can see that the forks are hardly compressed. The straps are pretty loose and the bike is very stable. Admittedly, the front wheel is kinda light so the Stand is more fussy to use there, but if you need it to raise the front end it works great once you find your strap points at the rear. I used it yesterday to change Julie's fork oil and since she had my floor jack in the truck with her, I used this old bottle jack. Very stable. Comments or Questions: After working with timber all my working life (now retired) i would feel happier if the eyes that hold the straps to the 4 x 2 were threaded through the timber with a nut and washer on the other side,end grain is not a good fixing in that situation, not a criticism, it's a brill idea, my comment is made with safety in mind, Regards Dennis REOC 10055. Make optional: Royal Enfield Model "G"
This message is auto-generated by your web site when the form is submitted by a site visitor on page "Contact_Me". No need to reply. Well, you have a good point, but let me explain how this happened. As the title of the bike stand suggests, I built the stand when I was really broke. I had to use what I had on hand. The tie down "eyes" that I had available were the "screw type", and therefore I felt that running them through (side to side) might actually cause the wood to split. From my experience, it seemed that running screws with the grain would have less of a splitting effect. It also seemed that I'd be using more of the wood to hold the screws since the board is only 1 1/2 thick anyway. I did drill a pilot hole at any rate. Oh yeah, I also placed the "eyes" in the center on the end of the board. My reasoning was to prevent the straps from creating an upward twisting torque on the 2 x 4 which might loosen it from the base. I do admit that if I had had some "eye bolts" with nut and washer that I'd have done it, as you suggest. The washer would distribute the "forces" over a wider area of wood and the through hole would not have the same splitting effect. So I agree with your comment. However, if you decide to build one of these stands, you will also find that you need very little tension on the straps to actually hold the bike vertical. After all, just think about how much force you exert to keep your Enfield upright when you are sitting on it. Not much, unless the bike actually begins to tip past the center of gravity. On a side note, let me mention this. Both of my "eyes" are bent on my "one and only prototype". In all my testing, goofing around plus actual work with the stand, the eyes have become bent in a rearward direction, and the wood has not split at all. Maybe I just got lucky. One real improvement that I would make to the Poor Man's Bike Stand would be the length of the base. In hindsight, I'd have made it longer to allow the jack to sit upon the base. That would have put the balance triangle on the same base area. As it is now, the weight on the front wheel is the only thing that steadies the stand on the floor. More downward force from the jack would provide more stability for the front wheel. Thanks for your comment. I do appreciate that you took the time to offer your thoughts. If I ever build another one, I will probably use your suggestion. PS - I think that I will post an edited version of this discussion on the web site. A longer base that allows for the jack (and weight of bike) would provide more stability. This would prevent the wheel and jack from moving independently while working on the bike. I love the dog, we have boston's as well, as a matter of fact we just had puppies... The puppies look like little cows.